The reason why I started batch grilling chicken about two months ago was to save time in the kitchen & money! It’s also so hot & humid in the summers here in Missouri that I didn’t want to heat up the house any more that it already does! 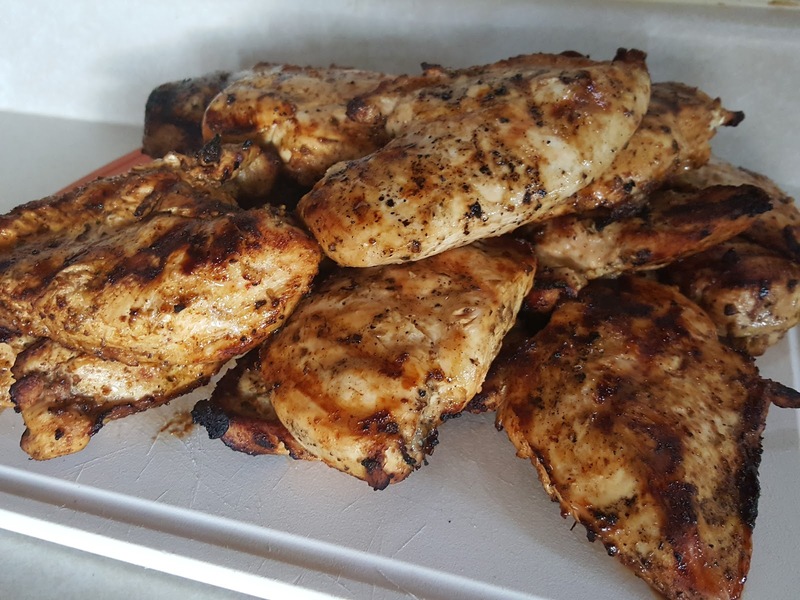 Three main benefits that I have found with batch grilling chicken breast are that I can now pull a meal together fairly quickly. I am not making a mess in the kitchen because the grill is doing all the work! Also I am saving money because have the work is already done, there is no excuse of I don’t have time to make lunch etc. Here’s what I do, I state by buying 3 big trays of chicken breast from Sam’s Club every other week. 2 trays are for batch cooking and the other tray is to have regular uncooked chicken breast on hand for other meals. Each tray has about 8 good sized chicken breasts. 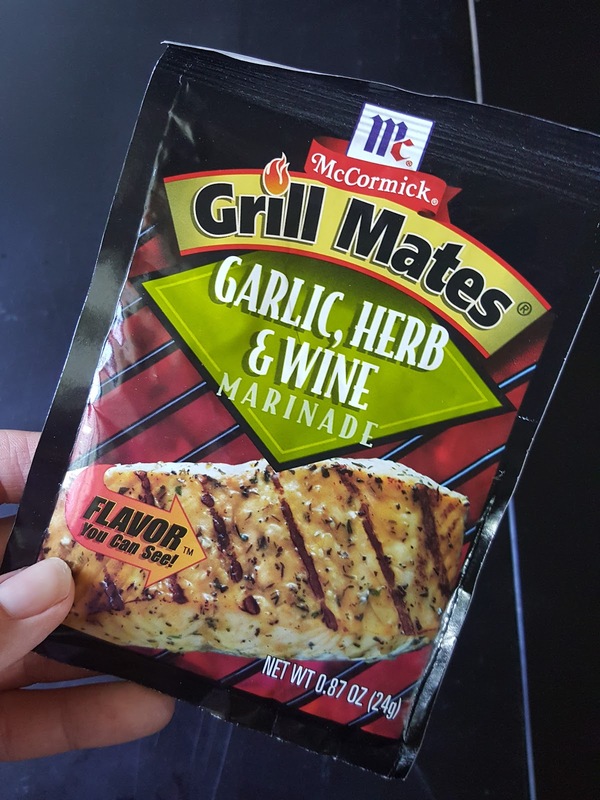 I like to marinade the chicken before hand and right now these are my current favorites by McCormick, Grill Mates. The have a few different flavors that accompany chicken and this is one of my faves! 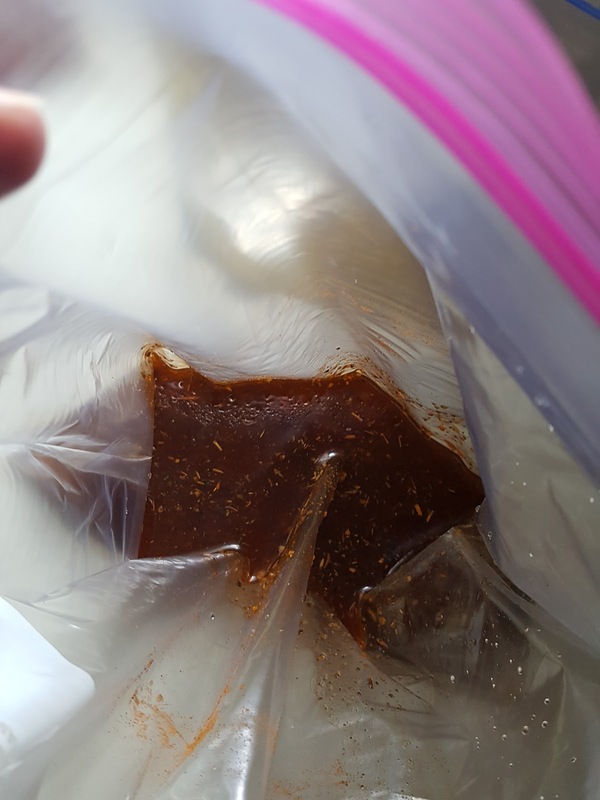 Now you need 4, 1 gallon size zip lock bags & 4 Marinades. On the back of each packet it will tell you what to add. It’s oil, water, vinegar and the seasoning. I prep all four bags so all I have to do is place the chicken inside! 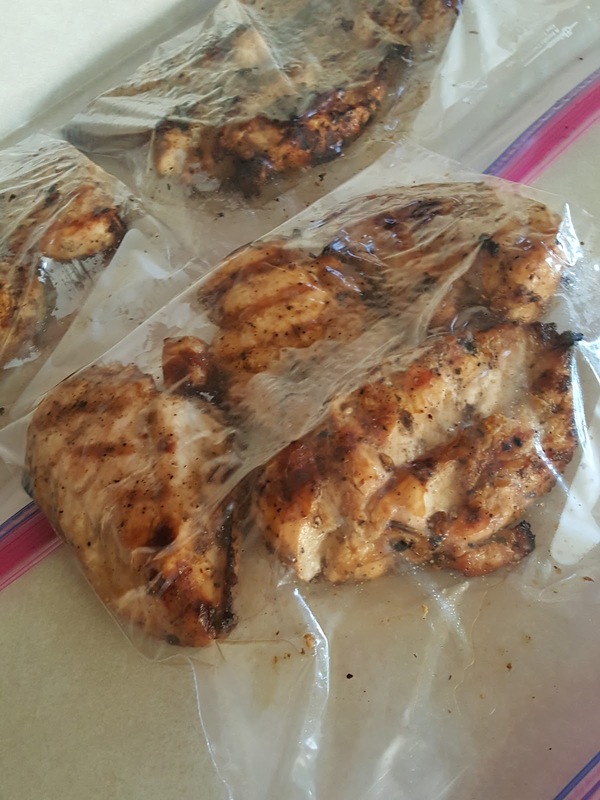 Each bag has 4 chicken breast marinading, I always place on some sort of tray just in case one leaks! Now they go in the fridge for about 3 hours, turning them over half way through. 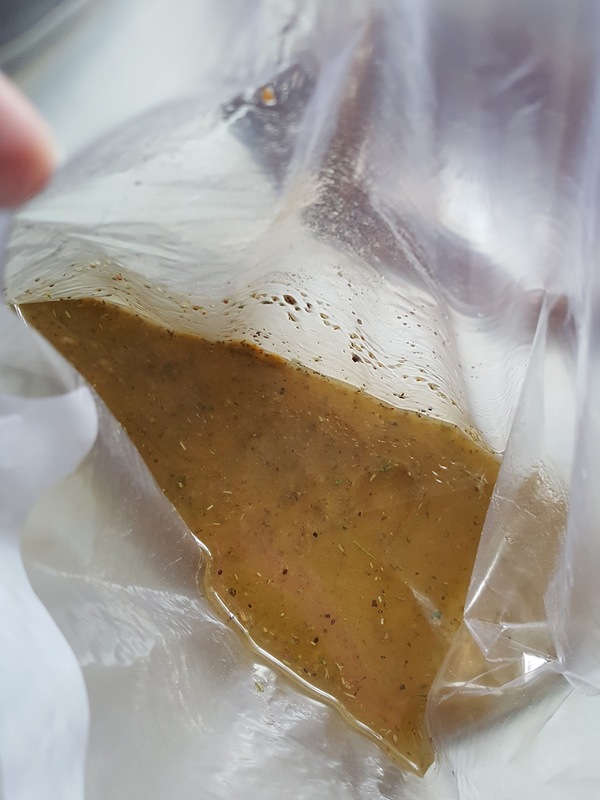 They say that it can be marinaded for a minimum of 30 minutes but I find 3 hours is well worth the wait. I start by preheating the grill on high, then when I’m ready to place the chicken on the grill, I bring it down to one notch about medium. On my grill that is a number 6! 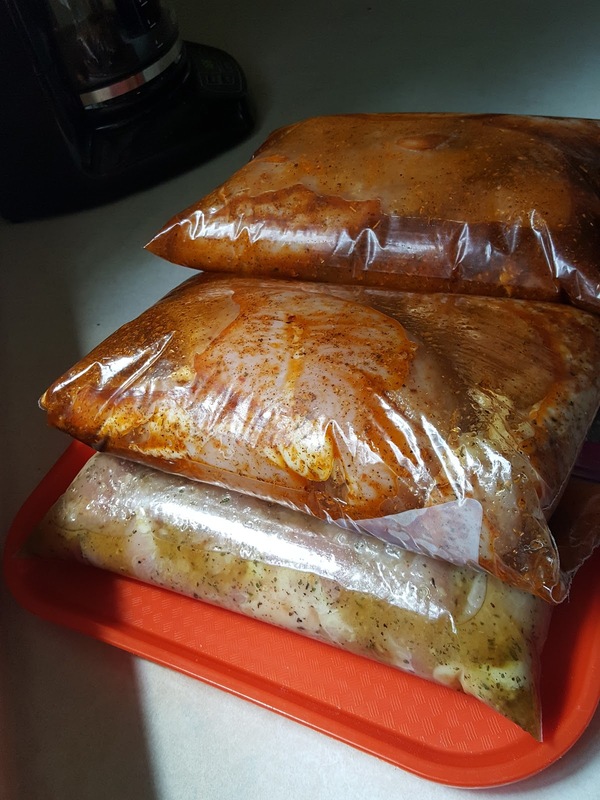 When I am grilling multiple marinade flavors I like to keep them in a line as well so when I take them off the grill I know what ones are what and I can package them accordingly. 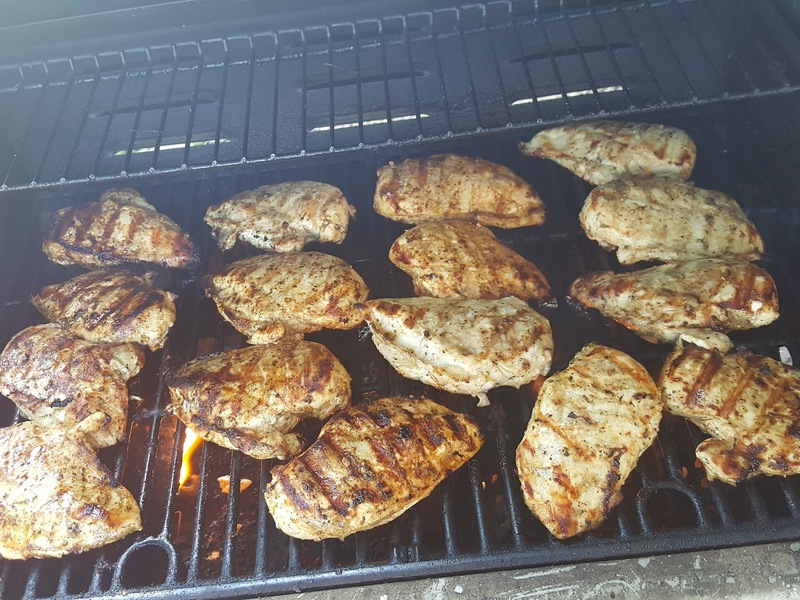 Now when I take them off the grill I usually place the chicken breast on my largest cutting board because it has a lip around the perimeter to catch the excess juice. I also tent the chicken breast with foil and let them all come to room temperature! 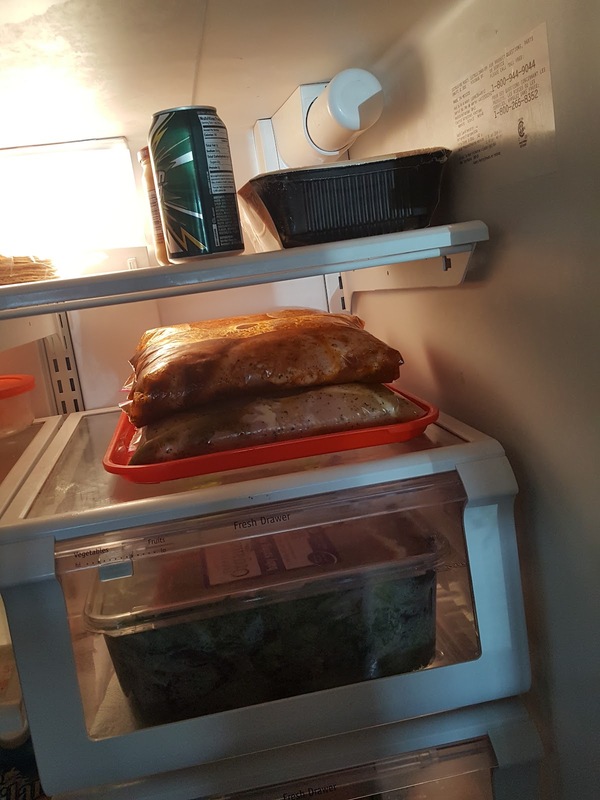 Now that they are all room temp., I now place 4 chicken breasts in freezer style Ziploc bags, you can write on the bag the date prepared so if you have multiple bags you know which ones need to be used first and place in the freezer! So let’s break this down you have 4 bags of cooked flavorful chicken breasts that costed you about $7 dollars a bag!!! What…you can barely buy yourself a Starbucks & baked good for that!?!? …and that is your families main protein for whatever meal you are making, H-U-G-E time & money saver! grilled chicken on top of salad. regular chicken sliced with a baked potato and a side. fajita quesadilla with grilled bell peppers. chicken burritos with rice & beans. fettuccine alfredo with sliced chicken on top. that is just a few ideas…you can also go on good old Pinterest and type in chicken breast and see ALL the recipes that come up for ideas! Let me know what you also like to batch cook?!? Previous Post CALIFORNIA & MADDIE DID NOT MIX!